In a post about marriage, I mentioned that I see marriage as a way of symbolizing the commitment between two people. I’m a big proponent of marriage. I love the notion of knowing that you want to share your life with someone, and that no matter what life throws at you, you will always be there to support the other person and that you in turn can count on them to support you. This sense of commitment is at the heart of what allows you to be more than just two individuals. So what exactly is commitment? In sickness and in health. This one seems easy enough, though some sicknesses can take a big emotional toll on people and relationships. Even still, most would agree that walking out of your marriage because your spouse is sick is pretty despicable (things like alcoholism and mental illness complicate this a bit). In good times and in bad. This is a real tough one, and really illustrates to me that the marriage has to become about more than just two people. Let’s face it, you ARE going to have bad times. You are going to have times that you hurt each other, and times that you really don’t like each other. At those times love can seem tenuous, and it’s at those times that your commitment to one another will be tested the most. Till death do us part. It may seem silly, but to me this is the dream. To know that it doesn’t matter what life throws at you, nothing will be able to get between you and keep you apart. Until you get to those bad times though, you don’t realize that the level of commitment required to make that happen is staggering. Let’s say most people get married between 25 and 35, and the average life expectancy for men is around 80. That’s around 50 years for a marriage to stay together in order to hit “till death do us part”. People change, so that commitment needs to be there. A while back I went for lunch with a female friend of mine who has been married for a number of years (probably 7 or 8). As we were talking, it came up that she’s a bit unsure about their future. She told me she loves him, but she’s spent time wondering if this was it, if this was as good as it got. She wonders if maybe there was someone else out there who she could be happier with. It didn’t sound like she was overly dissatisfied, and she made it clear to me that she wasn’t looking for anyone else. But at the same time, she wondered. And from talking with some of her girlfriends, she found that she had other friends who were thinking through the same things. She told me that she was open with her husband about her misgivings, and it frustrated him (well, yeah!!!). I have to admit, I was shocked. Here was someone I had known for years, who I’ve always believed had a good head on her shoulders. But the way she was talking she had some ambivalence towards her marriage. Now I don’t know her husband well, but I’ve met the guy a few times. And between my impressions and the things she would tell me about him he seems like a pretty good guy. So of course I started to look at it the way most guys do – as a problem that maybe can be fixed. I asked her some questions. Were there issues between them? No, not really. Was there anything wrong with him? Again, no. She couldn’t really articulate what was missing, she just had this sense that maybe there was something more out there. Have you ever had a gym membership? If not, have you ever bought a piece of exercise equipment for your home (same ideas apply)? Many people get a membership and at first they use it quite regularly. But after a while the novelty of going to the gym wears off and it’s not used as frequently. Things like work, kids, or just life in general start to get in the way. It gets harder to make it to the gym, and it seems like there just isn’t enough time. After a while, people realize that they’re barely using the membership. They may look at it occasionally and feel guilty, knowing they *should* be using it. Once they’ve gotten out of the habit of using it, it becomes hard to motivate yourself to get back. Periodically they will make use of it, but once they’ve let it drop in priority the same effort isn’t there. They may still use it, but they are just kind of going through the motions. Some people hold onto the membership anyhow, telling themselves that they will get back one of these days. Others realize that they won’t get back, and they cancel the membership. Believe me, if you attend a gym regularly you see this cycle play out frequently. After a while you get to know who the regulars are and who the drop-ins are. Usually at new years the gym will get a rash of new people, but within a few weeks the numbers start to drop. Some drop quickly, others last a bit longer. In fairness, some do to stick it out and become new regulars. The exact same thing happens in relationships. The success of a relationship really comes down to commitment. What you get out of a relationship is completely dependent on what you put into it. Thinking of the traditional marriage vows (listed above), I realize that they are missing something important. They really just talk about staying in the marriage under all circumstances (sickness, health, good times and bad), and that is part of it. But is commitment really just about staying in the marriage? Just because you haven’t physically left a marriage, does that mean you have kept your vows? No. Just like going to the gym and going through the motions won’t help you get stronger or lose weight, staying in a marriage doesn’t mean you are committed. Commitment is about what you put in. 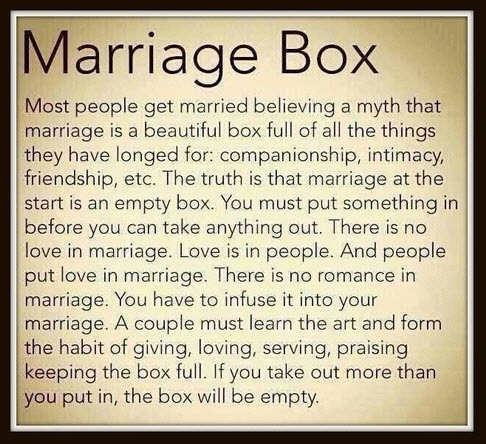 I love this concept of a “Marriage Box”, and to me it sums up everything about what it means to be committed to a marriage. I used to think the commitment was only about a refusal to give up. But the more I look at it I realize that commitment is not just about what it takes for someone to walk away from something, but it’s about what someone is willing to put in. It’s about not just worrying about yourself, but also dedicating yourself to you spouses welfare and happiness. In the book “Love is Never Enough”, Dr. Beck gives examples of some of the couples he’s worked with. In one of the examples (starting on pg 221 if you’re interested) he describes a woman who had a negative image of relationships from her parents. She married, but for fear of getting hurt she never truly committed herself to the marriage. She held back, and was constantly looking for flaws in her husband as these gave her rationalizations for not fully committing herself to the marriage. The problem is, by not fully committing she also caused considerable tension in the relationship. Her efforts to protect herself from potentially being hurt put her on the path to destroying the very relationship that she was scared of being hurt by. Thinking of my friend, I wonder if there is something similar happening. Has she really committed herself to the relationship she has with her husband? I don’t know her situation, but she could take the time she spends thinking about what “could be out there” and focus it on making her relationship the best it can be. The example from the book does seem to have a happy ending though, and I think it’s one we can all learn from. As the wife started to focus on the positives in her marriage she was able to commit herself to it more. As she gave more of herself, she ended up receiving more in return as her husband was more loving and attentive. Her relationship strengthened, and she found that as she put more of her heart into it, her relationship became more fulfilling. If you read my post on happiness, you know that I’m a big believer in the power of positive thinking, and I believe that it’s a key to happiness. Focusing on what you have instead of what’s missing will give you a greater appreciation of the things you do have. When it comes to relationships I can guarantee that for anyone, in any relationship, there IS someone else out there that you *could* be happier with. But so what? Perfection doesn’t exist, it’s an ideal. No relationship is perfect. Short of any deal-breakers (infidelity and abuse being common ones for people), what you have today can probably get better if you and your spouse commit yourselves to the relationships and each other. Embrace what you have and see imperfections as ways to improve. Get out of that mindset. Ask yourself what you can do, today, to make your relationship better. Recommit yourself to your spouse and your relationship, and embrace a happier future. « It’s Time for a Check Up!!! I really like the statement “Perfection doesn’t exist, it’s an ideal.” How true is that? The marriage box is also a very different perspective of what marriage is. I think too many young people get married thinking this box is already full – and are sadly disappointed when they figure out just how much work is needed to sustain the marriage, and then give up much too early. I think that when relationships break down, it’s often because the focus has shifted from the “we” to the “me”. Instead of looking as the relationship as something that needs to be nurtured and grown, people start looking at it from a selfish perspective. What has he/she done for me lately. They are taking from the marriage box without putting anything back, and then they blame the other person when they find the box is now empty. Life is all about balance. A while back I wrote a post comparing a relationship to a sports team, and I think the analogy works beautifully. A team is nothing more than a collection of individuals that are working towards a common goal. Thing is, each member has their own individual goals too. If a team member is asked to sacrifice too much of themselves in pursuit of the common goal, they may come to resent it, and it undermines their satisfaction with the team. But if a team member starts focusing on themselves at the expense of the team, it can tear the team apart. Finding that balance can be very difficult for some people. In some ways I think marriages do require a lot of work, but in other ways I don’t think they require any work at all. Marriages do require sacrifice, and they require people to always take into consideration how their decisions and actions will impact the other person. You also need to prioritize the relationship, and make time to nurture and grow it. If you approach the world with a self-centered focus, then that does seem like a lot of sacrifice and it can seem like a good reason to walk away. But if you are already prioritizing the other person in your life and taking them into consideration, then the things that are required for a happy relationship don’t really seem like work at all. That said, there will always be tough times. During those times I feel it’s important to step back from the emotion of the issue in front of you and keep a long term view. If you are in a relationship, you came together for a reason (hopefully that reason wasn’t just he/she had money). Remember what that reason was. I’ve spent a lot of time thinking about this stuff, and to me relationships should be SO EASY. If you love each other, and continue to value the other persons needs at the same level as your own, things should just work. Value the person in your life, and show them that every day. Just through little things – a look, a smile, a touch, a quick “hi, thinking about you”. I don’t believe in diets. I think the concept of a diet suggests a temporary thing, and I hear so many stories about someone who goes on a diet to lose 20 lbs, and then gains it all back a year later. Diets are band-aids, they don’t work. If you want to lose weight and be healthier, it needs to become a lifestyle change. Gradual weight loss as you adjust your lifestyle permanently is always a better option. Relationships are also a lifestyle choice. Don’t wait until you are in trouble before you start to focus on it. Live the relationship. Appreciate what you have, and try to enjoy the other person every day of your life. If you live like that every day, those actions that seem like work at first become natural.